Hyderabad: The Sun took off smoothly, steadied itself splendidly, and then sank without a trace. 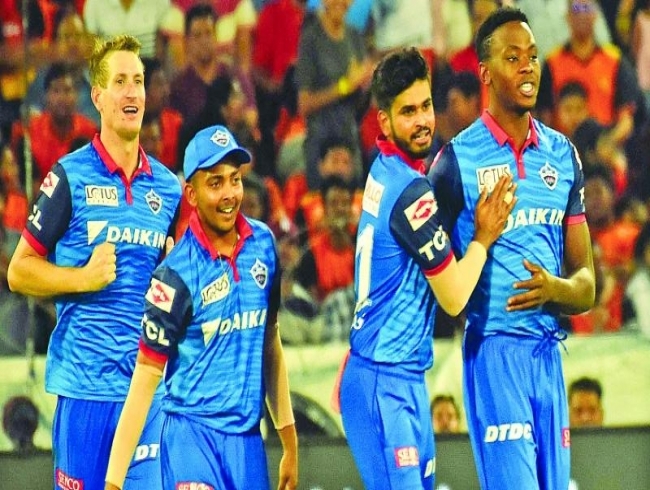 The Delhi Capitals defiantly defended a modest 155 to dig out a 39-run win and race to second on the IPL points table. Sunrisers are stuck at No.6 with just six points from seven games, courtesy four losses. That was unexpected of the hosts half-way through the innings. Openers David Warner and Jonny Bairstow got off the blocks in a flash, rattling runs left, right and centre. The Aussie-English combination, that began this IPL season with three successive century stands, showed scant respect for the Blues bowlers even as pacers Ishant Sharma and Kagiso Rabada sent down thunderbolts. At the end of the Power Play, all power was vested in the Orange camp which was grinning at a healthy 40 for no loss. It was not until the 10th over that Delhi could make a dent, Bairstow caught by Rabada at long-on off quick bowler Keemo Paul. Sunrisers 72 for 1. The Englishman’s 41 came off 31 balls, five of which crashed against the boundary five times and sailed over it once. Captain Kane Williamson did not last long and fell to a brilliant, forward-diving catch by Rabada at mid-off after making runs in tune with his batting position – 3. Ricky Bhui’s dismissal was always in the air. The youngster lived dangerously, playing uppishly and surviving out of good fortune. He pushed his luck too far and was out on 7. Warner and Vijay Shankar fell on successive deliveries in the 17th over, with the score reading 106 as the Sun began to go down as Rabada (4 for 22), Keemo Paul (3 for 17) and Chris Morris (3 for 22) turned it around. Earlier, left-arm medium pacer Khaleel Ahmed snared 3 for 30 and seamer Bhuvneshwar Kumar grabbed a couple while conceding 33 runs as the hosts limited the visitors to a modest 155 for 7. Khaleel justified his inclusion in the side by dismissing Delhi’s dangerous openers Prithivi Shaw and Shikhar Dhawan cheaply – they made 4 and 7 respectively. On the other side, Colin Munro, who came in for Colin Ingram, played his part too. Coming in at No.3, the South African southpaw went slam-bang, striking four boundaries and three towering sixes in his 24-ball stay that yielded 40 runs before he nicked newbie Abhishek Sharma for wicketkeeper Bairstow to pick the second of his three catches. The 18-year-old left-arm spinner had made the side in place of Yusuf Pathan and his prize dismissal ended a 49-run stand for the third wicket in the eighth over. Captain Shreyas Iyer (45, 40b, 5x4) then got together with Rishabh Pant (23, 18b, 3x4) to raise 56 runs for the next wicket but both batsmen fell in quick succession – Bhuvneshwar and Khaleel picking their wickets in the 17th and 18th overs respectively. Tailenders Axar Patel and Keemo Paul struck an odd blow each but the hosts did well to restrict their rivals to a total within reach. Both teams shuffled their packs for the game. Sunrisers made four changes.